Now about that new favorite kitchen tool: It’s a tapered French dowel-style rolling pin, and it cost $10 at Sur La Table. After owning it less than a week, I’ve already used it to pound spices and flatten chicken breasts (both spices & chicken were inside plastic bags), roll out dough, crush ice, whack oranges for easier juicing, smash garlic cloves…. Who knew that a big hunk of solid maple would be so handy in the kitchen? Drats!!! Well if we can’t get the Limoncello maybe we can get the lemons! Last year the freeze killed all my citrus trees. I am thinking about avocado. Any experience with growing avocado? My mother had an avocado “bush” in her yard for years…it would regularly freeze back to a nub, resprout, and then cold would kill it again before it was large enough to bear fruit. I’ve seen many in SELA bear fruit–but the location has to be sunny & well-protected from frost. Like up against a south-facing brick house wall, or in a corner shielded from north winds. A friend gave me a large, vigorous tree; I planted it in the yard and cold killed it during the very first winter. Aw darn. Congrats to Becky and Rhett though! Had to pay shipping but this is Cooks Illustrated highly recommended rolling pin, and I don’t buy any kitchen appliance, tool, or gadget without first checking with them. Figure a bunch of professionals who put everything through its paces will be able to make better choices than myself. It was the 1528 model, looks like what you bought. So have you used it yet? 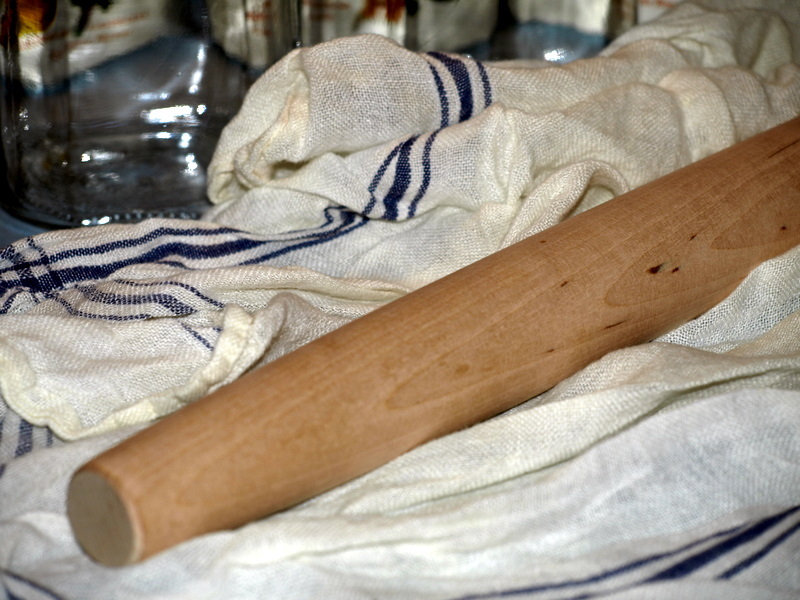 I rolled out pizza dough yesterday and I’m wondering why anyone uses the “handled” rolling pin at all. The handled pin is impossible to use one-handed, but the dowel pin was a cinch with one hand. I could use the other hand to rotate the dough quickly, yet never stop rolling. About how heavy do you think that rolling pin is, Boullie? Do you think heavier is better? Or lighter? I saw one at W-S today, but it felt so light weight, that I questioned the value of it. It weighs just shy of a full pound, 15 and 5/8ths ounces to be precise. I’ve been using one of my old police nightsticks for similar tasks. It’s made of rosewood.